A fresh summer salad that you can take to any potluck picnic or dinner party. Add dressing ingredients into a small mason jar. Shake and set aside. In a large bowl mix the rest of the ingredients. Add dressing and refrigerate for a least 1 hour or overnight so flavors can blend. Mix before serving. If using canned beans rinse them under cold water and drain well before using. 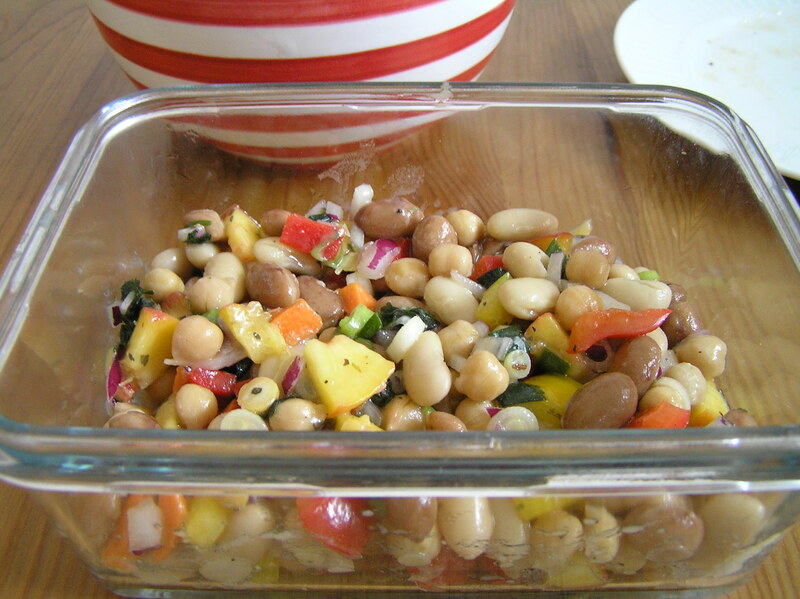 Save the other half of the canned beans by placing in a mason jar or baggy and freeze for future use. Use different kind of beans. Hello Lia, Usually my kids avoid salads, but after looking at your recipe I am sure they will enjoy it, it looks so mouth-watery. Will try it today, as I was looking for different ways to make salad with different taste and I think this is the perfect salad recipe I was searching for, I will try it at dinner if that works for them, will surely add it my list. Hello, Seema. Let us know how your kids liked the salad. It is one of Mary’s signature salads! Hi Lia, I tried it yesterday, and I added some lemon juice drops over it and it simply worked out great, my kids loved it, and also it’s on my list now. Excellent, Seema! Adding lemon sounds great and we’re glad your kids liked it. Please try some of the other recipes and give us your feedback. We’re always looking for ways to make them better.